Bumpy motions won't jar the door open if you're using the Safe Push Touch Latch. 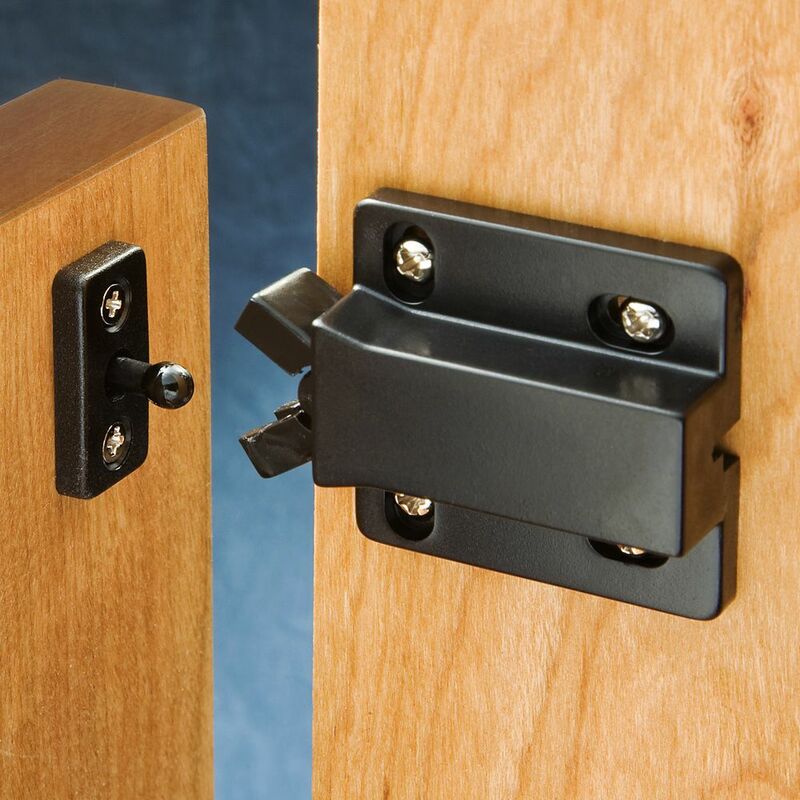 The Safe Push Touch Latch is excellent for mobile homes, trailers and earthquake zones. Mechanical, non-magnetic plastic latch is safe near computers. Cabinet door latch worked great! I live between the San Andreas and Hayward faults, so it's important to have some way to keep the cabinet doors to stay closed when there's an earthquake. These latches haven't been tested by a significant quake yet, but they appear to be at least as likely as any other latches to work when the ground starts shaking. 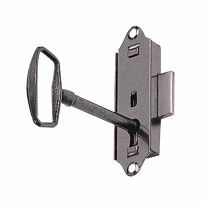 The latches are very well designed (they allow some installation misalignment) and well constructed (unlikely to break). I got the "mini" version, which still seems plenty strong. They work by a tiny push and then a pull on the cabinet door. It takes very little time to get used to. I am very happy with these latches! I haven't been able to get the latches installed, but my daughter and son-in-law have them in their kitchen and I was impressed with them. That's why I ordered them and hope to get them in soon. Mother-in-law to-do list is lower on the priority scale than wife to-do list! I like having the chance to remove knobs that have been placed high on the upper cupboard doors and just being able to push on the lower corner of the door to open them. By using this latch on the bottom of a Suggestion Box only a couple people know how to open the box. It is completely hidden. Much better than older types. Very easy to operate. I tried to explain to my carpenter what these are, so I just bought it and Ed it myself. It's a great piece, well worth the minimal effort. Rocker's website was easy to use, and delivery was quick! Yes I'll buy from here again if needed. These safety push latches were perfect for the slatted oak gate that I installed at the head of my cellar stairs. Easy to install and secure the gate from over-swinging. The latch worked perfectly for my needs. It is a well made product at a reasonable price. Both the product and the service were great. I would have preferred white color rather than black. We've been using these latches in our kitchen cabinets for 12 years. I'm back to get a replacement for the one on our glasses cabinet most popular in the house because part of the spring mechanism finally gave out. None of the sturdy plastic components has failed to-date. When these were originally installed our contractor fretted because he didn't like the small 3/16&quot; gap the push-pull action of the mechanism requires between the door and the box. 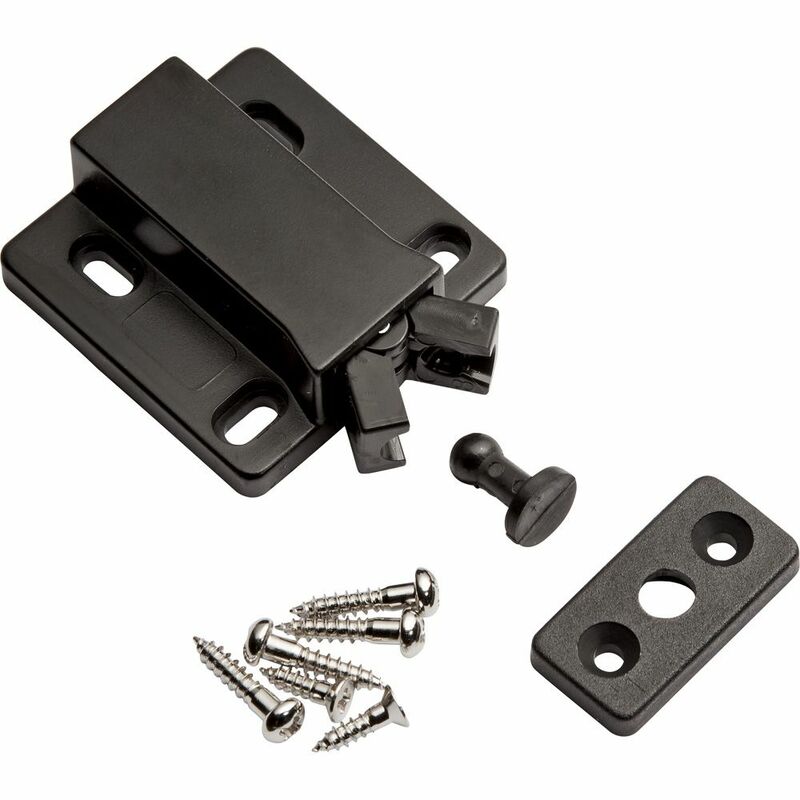 We felt the gap was minor and a small price to pay for the ease-of-use this latch offered when compared to other latches offering the same type of cabinet door security. Excellent latch -- installation was fairly easy, though I was surprised to find that the white latch is made of plastic (looks like metal on the web site). Using it day-to-day on our most frequently accessed cabinets we find that we need to push the cabinet door back in (after closing) to engage the lock -- so it it is push to open, open the door, close the door, push again to close. Not intuitive at first, but we've gotten used to it. It gives my wife peace of mind to protect the doors on our china cabinet, living here in earthquake country. The latch works well. I've been using it for 3 weeks and I expect it will continue function well. It would have been helpful if the manufacturer would have included instructions. I had to play with the adjustment because I couldn't see inside the cabinet. Used this on a pair of doors to a fold out router table. They were easy to install and have worked great. The latch works great after being placed on drawer three weeks ago. Definitely worried about the item is made of plastic, but am confident the item will last a long time. I used the latch to hold up a trap door in a false ceiling. Magnetic latches would not hold the panel up. Unit could use a template and instructions noting it has two different size screws. Good latch, for medium size door. Used on 2'x2' door and worked great. Sturdy latch. Very good for medium size jobs. Lining up the head blindly to meet the latch is challenging. Then the latch has a tendency to move. I'm going to try and replace with another option. Push touch latches were purchased to help keep pantry doors securely closed . To keep a rabbit hutch's doors closed in case it decides to run into them. I wanted a positive catch to keep the contents of a cabinet safe in case of an earthquake. Needed something that could hold 2kg without opening until pushed.. this is rated for 4 kg, so I've got room to spare! Used for them for cabinets in a trailer. I have something like this in my motor home. It is broken. Looks like the same one. Holds the bathroom door open. Perfect fit for the door I am repairing. I picked these for my project of hidden storage under basement stairs. Hopefully, these latches would keep the kickboards on for regular useof the stairs, and provide easy access to hidden co partments when needed. 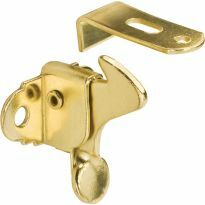 It's the style I'm after, and I heard from a colleague that the quality of this latch is decent. I was looking for it everywhere but could not find it. Not what I wanted but the only one small enough. Wanted to try a different style to see if I like better. 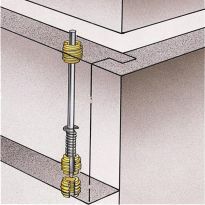 These latches will help earthquake proof a kitchen. To secure my tv in my rv while traveling. I was looking for something to attach the power supply for a cosplay phaser and this fit the bill. I also bought 2 extra to attach the face shield for my Ironman helmet. and I think this touch opener latch will make this possible. This latch (#99152) had the smallest footprint + the needed load capacity for my earthquake-related cabinetry (full overlay door design) needs. Unfortunately, this model was only available in black (I wanted brown). The other models offered w/ color choices were almost 1 inch deeper (unsightly). Love these latches on custom made entertainment center. Having a custom hutch made and want more of these latches for the new piece. If used for a drawer, can there be constant pressure on the drawer to be opened and the drawer will stay closed until it is pushed to be opened? Your assumption is correct, as long as the pressure applied does not activate the release mechanisim. In other words, a little pressure is fine, just be mindful that too much pressure will lead to weakening the springs over time, causing failure of the unit. Yes, the drawer will stay closed even under a good deal of pressure until it is pushed inward to release the catch. That is how I am using mine so far it has worked well. The draw is not opened often but it seems fine when used. probably the same as doors. Would this be good use for a garden gate--not too heavy? 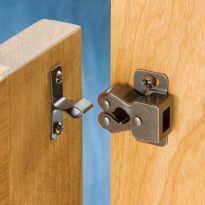 BEST ANSWER: Good thought, , this is a latch for a cabinet door designed to hold closed a much smaller area ,dimension and weight. If you can think it " it must exist" . So look around a heavy duty similar latch , check child proof latches if the gate is light and decorative. If, as you say it's not too heavy. It could. I could see the mechanism affected by the weather. Is there a way to protect it from the weather? The Peg is only plastic so, I can envision garden tools & supplies breaking the peg as on would go in & out of the garden. We used this lock for a closet door in our RV and it works great. I'm not sure that it is appropriate for outside use .However, it is not heavy or even very large. Hope that helps. my cabinets open in the middle. Would these still work? BEST ANSWER: As long as you have somewhere to attach the clip, (large rectangular piece) If it is the top rail of the cabinet frame, like I have for my aquarium DIY stand. Should be no worries. I like mine, the way it works and the way it holds. Just be really careful about mounting to be sure the door is where you want it. I rushed and my door is not flush with the cabinet. But, I'm okay with it. Yes they "can" work. these type of catches work best with inset doors. for your application you'll need to be more creative with the installation to avoid using the lower shelf as a mounting place. Oh yes. The latches will work quite well as mine have with similar middle opening doors. can they be used on drawers in a MotorHome? BEST ANSWER: I have used these on drawers before. But, because of the friction or tension on the drawer guides I used two on each drawer in order to get enough push to open the drawer far enough to get my fingers behind the edge of the front, I used the under mount drawer guides in order for all my hardware to be hidden. I mounted them in the very back of the cabinet on each rear corner of the drawer. Yes, that is exactly what we did with the one we bought. We had a door what kept flying open when we were driving so we replaced it with a safe push touch latch. You have to use it for a while to remember that you have to "push" before you "pull" but ti works perfectly. If there is room for the drawer to move back about 3/16 inch past closed flush this would be a good choice. Yes I used the ones I bought on my boat. I have a coffee table with a top that raises. it will not stay completely closed. Would two of these work? BEST ANSWER: I have used these latches on two projects. My guess is that you might not be satisfied. The reason being is that because they are "Push Touch", they don't close tightly. You push to close and push again to unlatch -- very clever. They need to be slightly open so that a push will allow them to unlatch. I would suggest magnetic catches. 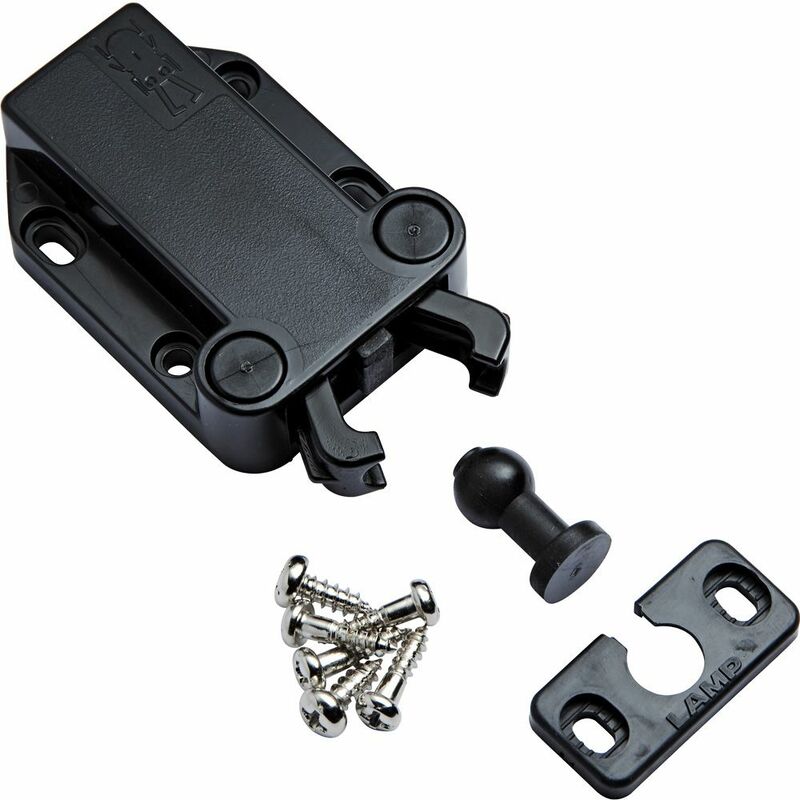 I used these on an RV medicine cabinet that would not stay shut with the magnetic latch. With all the bouncing in the RV they still held the cabinet closed. I would think that they would work for you depending on how much pressure the table put on the latch. 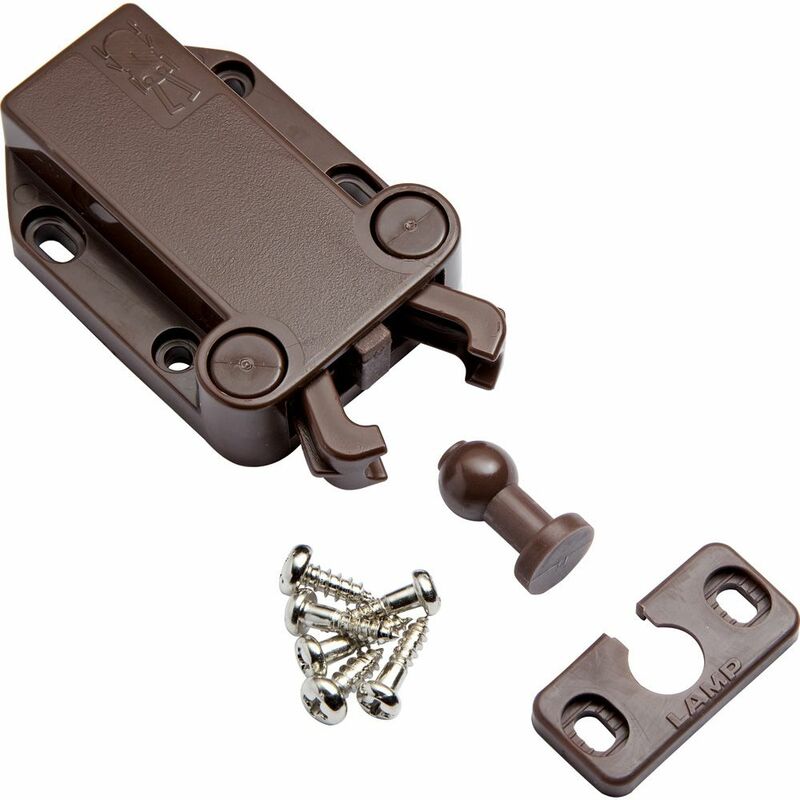 These latches are a lightweight latch for holding a cupboard door closed. A table of any weight holding a hinged extension together would be something I would not use this latch for. Are the safe push touch latches for a large cabinet door??? Would they work due to the weight? I have one for a 24' TALL x 20' wide, 3/4 plywood door on an aquarium stand. It holds it's place, It is easy for the door to open with a gentle push. When my dogs start to "roughhouse" and bump the door it will open to an ajar setting. Not fully, but you can see the difference. AS long as the door is level & plumb, the latch should hold it in place. My latches are being used on a spring loaded device on my boat. It's a pretty strong spring and they hold. No sure if this helps, good luck. Could I use them on fridge doors? 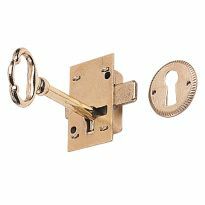 I need a touch latch for a full size antique wood wood that I’m installing in my pantry. The door is over 100 years old and took a lot of time to strip and the-finished, so the last thing I want to do is to cut a hole in it for a door knob. 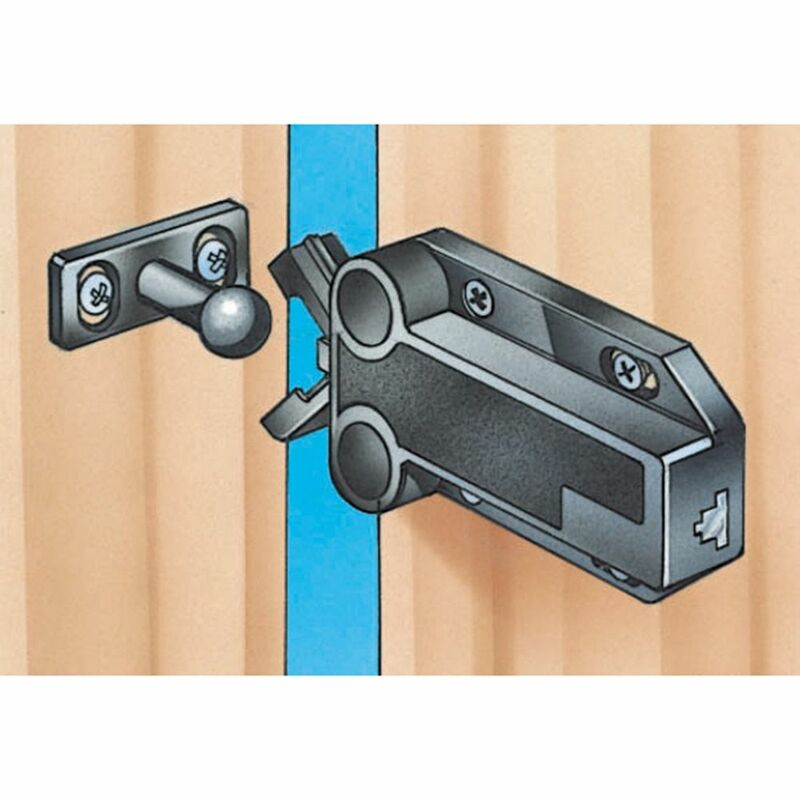 What size/type of magnetic latch system would you recommend? Would it work for a Murphy door? Will these work for under the counter drawers for a kick touch drawer?